By now you’ve probably seen our exciting news, and if not, here it is—Change 4 Growth is going international! We’ve officially announced that we are opening an office in London. Opening an office anywhere is a big step, but especially one across the Atlantic. There are many factors that go into such an exciting decision, and it’s not a decision that was quick. Over the past 12 years we have been refining our process and making Change 4 Growth the best it could be for our clients and ourselves. And now, with the success of our clients in the US, we know that what we’ve built and the solutions we offer can be replicated again to provide more great value to clients all over the world. Our CEO, Beth Thomas, has been traveling to London for many years and found herself enamored by the city. After years and years of refining Change 4 Growth as a company and the services it offers clients, Beth knew it was time to open a second location. Now, this left her with one question—where? The final decision to launch in London came fast once we found David Lucas, Change 4 Growth’s new managing partner in London. He has vast experience, a style that fits perfectly with Change 4 Growth, and the heart of a servant leader—we knew David could help us be the best. We fully believe that once you find the right person, everything else sort of falls into place. From the very beginning, David felt like the right person and that made opening an office in London an easier decision. This, coupled with our love for London and our sister company, Thought Provoking Consulting, being there, made our decision a slam dunk. Thought Provoking Consulting is located in London and is a huge player in the retail sector. They focus on solving retailer’s business problems and reaching their goals. Having them right in the same city means we can add value to many of the retail clients in the UK. The decision to hire David Lucas as the London office’s managing partner felt like a no brainer for us. David has over 25 years’ experience consulting in the retail sector and leading organizational, operational and technology-based change initiatives. His career began in marketing, when he worked for four years with a marketing agency, followed by four years as a corporate manager responsible for aligning international offices with corporate marketing strategy. From there, David spent a year studying human psychotherapy, giving him great insight into human behavior, a skill set he utilizes frequently when leading organizational change. After his time spent in marketing, David transitioned to a career focused on change management and supply chain development for a variety of organizations, where he managed projects of huge scope and developed his focus in the retail sector. Overall, his experience at all levels has provided David a thorough understanding of change management, business management and development and a deep appreciation of the cause and effect along an entire value chain. With David on board, we know we can be the best. We believe in David and our solutions and can’t wait to see what exciting things David brings to the table for Change 4 Growth in the UK. 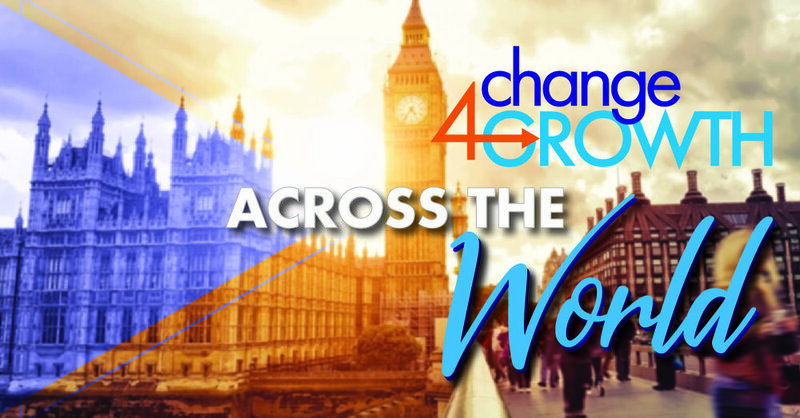 Change 4 Growth is extremely optimistic about growing the company in London. After refining our solutions, processes and culture for the past 12 years we knew it was time to share our expertise and proven approach with other companies around the world. We don’t want to be the biggest, but we do want to be the BEST. We can’t wait to bring our experiences and solutions to the London market in a way that is unmatched. We look forward to sharing more information about our UK launch, our new managing partner, David Lucas, and the exciting news to come. Follow Change 4 Growth on Facebook, Instagram, and Twitter!